Last week I did an experiment with some boneless chicken left in my refrigerator. My both kids loved this recipe too much. It's inspired from a similar Mexican variant, but I've done some local changes to satisfy the taste buds of my 3 kids (3rd one is my hubby). It came out very well and vanished within 5 minutes from the plate. I've used classic corn tortillas for making this yummy preparation, but you can substitute it with local flat bread if the corn version is not available in your locality. You can also substitute chicken with mushrooms or cottage cheese to make a vegetarian version. Let's see how to make these easy, tangy and scrumptious chicken rolls which are perfect for snack time or breakfast. 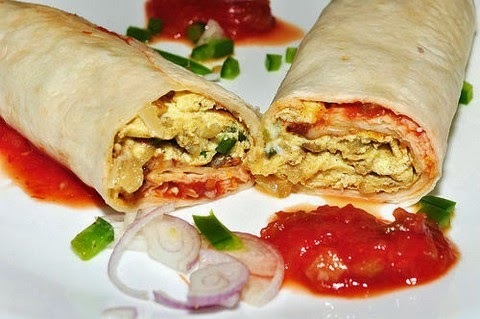 Relish this tangy and flavorful chicken roll wrapped in corn tortillas and seasoned with tangy and spicy flavoring agents to munch while sipping tea or coffee. 1. Take some oil in a non-stick pan and add 3/4 of sliced onions. 2. Saute for about a minute and add chicken pieces. 3. Add black pepper powder and 2 tsp pesto sauce. Stir well for about 3 minutes. 4. Add lime juice, cover the lid and let it cook for about 5 minutes on very low flame. 5. Remove from flame and keep aside. 6. Grease a flat non-stick pan with olive oil. 7. Toss tortillas on both sides for about half a minute. 8. To make the roll, place tortilla on a flat surface. 9. Place chicken and onion mix in the center. 10. Add pesto and chilli sauce on top. Add tomato ketchup as well. 11. Roll them and place them in a plate with salsa. 12. Garnish it with sliced onions and diced bell peppers. Serve hot.